So I'm taking my first "real" stab at gardening this year. 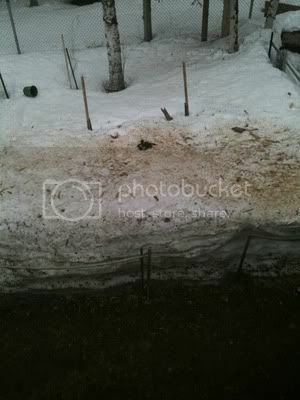 I've got about a 12x20 area where I place to grow corn, carrots, beans, peas, potatoes, pumpkins and cucumbers. Been preparing a compost pile since last year and recently mixed that in with the garden soil. Have seedlings growing inside (not quite outside time yet in NE NY), and planted a couple of raspberry bushes and a strawberry bush tonight. Still debating a couple of apple trees. $50 says I kill the whole thing, but I'm going to do my best. Any gardeners in the bunch here? Have grown a garden for years. Tomatoes, bell peppers, banana peppers, cucumbers, okra, radishes, and cayenne peppers. Yes, very short season here too - 20 miles from Canada. It was a super mild winter up here, though, and the spring has also been unseasonably warm, so that's allowed me to prepare the ground a bit before I might have been able to otherwise. Certainly I'm not growing on a scale that will make me self reliant, but it's a start towards learning the skills. Anyone have any advice for a new gardener? JustJ2k78 wrote: Yes, very short season here too - 20 miles from Canada. It was a super mild winter up here, though, and the spring has also been unseasonably warm, so that's allowed me to prepare the ground a bit before I might have been able to otherwise. Raised beds work best for me, be patient and work that soil, lots of organics, start compost to add every year and keep working that soil, seriously get some chicken poop if you can, its the best. If your in a cooler climate try a simple hoop poly system over your growing beds to increase the heat. I also have noticed the last couple summers fewer bees and have had to manually politnate things like squash...just some random thoughts. +1 on the chicken poop. Chicken poop is excellent! If none available, I use 13-13-13 when planting, and use miracle grow when watering. Plant in rows and make your rows high and wide. Stake what needs to be staked. If planting tomatoes or peppers, cut the ends off of a gallon can and place around plant to protect your young leaves from the wind. Remove when the plant becomes tall enough to outgrow the can. Radishes grow quickly and taste great. Plant by digging a trench and seed heavily. You will need to thin accordingly when sprouts appear. When making your bed, I always mix peat moss with my top soil and miracle grow garden soil. farnorthdan wrote: I had a little greenhouse for tomatoes and cucumbers but the dogs ate it. It was one of those cheapo ones from costco 4x8x6 that you put together yourself (cheap chinese crap), when my german shepard, Kcam, was a puppy he got mad at me one day because I didnt take him with me to work like always. I guess it was his way of telling me he didnt like being left behind, he totally destroyed it. I was kinda pissed cause it actually worked real good, especially for starting seeds, and growing tomatoes. It got hot as hadies in there. I'm thinking about building one again soon. I'm thinking 2x2 with fiberglass panels and roof. Heck, when my dog gets mad at me, he just craps the floor. louisianagold wrote: Heck, when my dog gets mad at me, he just craps the floor. I've got a cold frame up right now with beans, hot peppers, and tomatoes growing. Well, I may have already killed half of them, but they were growing at one point. Besides whatever compost I have in the soil, I fertilize with guano and liquid ferts found in the hydroponics store. I prefer the stuff found in hydroponics stores because they tend to be a bit cheaper and those guys control nutrients so that I can better control the fruiting cycle (change from high nitrogen to high phosphorus). JustJ2k, if you are in NE NY you should really check out dirtworks. They are in Vermont and have the best damn prices I've been able to find on guano and a few other things like worm castings and, yes, pallets of chicken poop. I'm actually going to be somewhere on that side of the state this weekend and I was considering loading up my little subcompact car with bags of guano, worm castings, coconut coir and ground crab shells. I've never been there, but I like to buy in large quantities, even if I don't need it, so the shipping would probably kill the deal for me. Looks like a pretty cool place - about a 1.5 hour ride for me, might be cool to head that way on a weekend (with the truck) to check it out! Thanks for the heads up! Love gardening... vegetables, especially. Nice way to start is with zuchinni... they grow themselves. I grew a hill one year and the wife loved it. Ate every one. Next year, I planted a full packet of seeds... 52 hills. It was like Invasion of the Body Snatchers! Don't forget that coffee grounds are a great source of nitrogen. If you're not a coffee drinker. Starbucks gives them away for free if you ask them. I have killed more tomato seedlings this year than the entire world combined. We have trees that are: nectarine, palmelo (spelling) and lemon. Our Japanese apple tree died. Our luquat (spelling) did not bear much fruit this year. Wow, quite a few gardeners here! I love it. Great prepper activity as well. I live in Texas, where we have a great long growing season but too hot for a lot of things like broccoli except for late fall and early spring. Can grow almost all year around here including seedlings inside during winter. I have a tiny backyard though, so I do what I can with the space. Have a couple of 4x4 raised beds and some fruit trees (Oranges, Peaches, Pomegranates) as well as a pecan tree. I also have blackberries, raspberries and blueberries but you really need to grow those in a pot. They sread across the ground and will take over your yard if not careful. Thornless varieties are preferred. 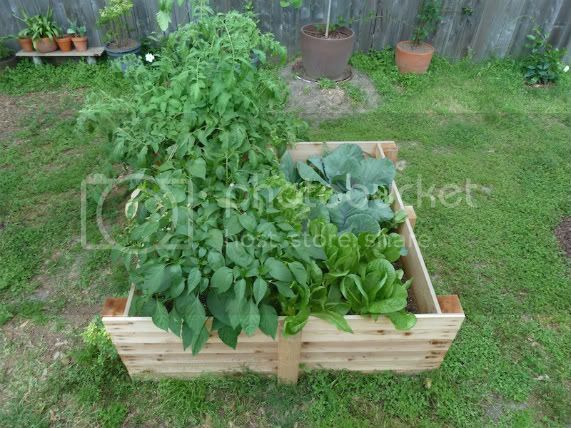 Here's a picture of a raised bed, 4x4 and 2 feet high. If you plan you can pack a LOT into such a space. The tomato plant this season is a BEAST! Let's see some pics of everyone else's garden!